The Samanids promoted the arts, giving rise to the advancement of science and literature, and thus attracted scholars such as Rudaki, Ferdowsi, and Avicenna. While under Samanid control, Bukhara was a rival to Baghdad in its glory. Scholars note that the Samanids revived Persian language and culture more than the Buyids and the Saffarids, while continuing to patronize Arabic for sciences as well as the religious studies. They considered themselves to be descendants of the Sasanian Empire. 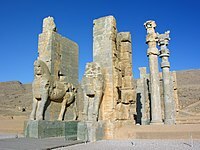 In a famous edict, Samanid authorities declared that "here, in this region, the language is Persian, and the kings of this realm are Persian kings." In 839/40, Nuh seized Isfijab from the nomadic pagan Turks living in the steppe. He thereafter had a wall constructed around the city to protect it from their attacks. He died in 841/2—his two brothers Yahya and Ahmad, were then appointed as the joint rulers of the city by the Tahirid governor of Khorasan. After Yahya's death in 855, Ahmad took control over Châch, thus becoming the ruler of most of Transoxiana. He died in 864/5; his son Nasr I received Farghana and Samarkand, while his other son Ya'qub received Châch (areas around modern Tashkent/Chachkent). Meanwhile, the Tahirids authority had significantly weakened after suffering several defeats by the Saffarid ruler Ya'qub al-Saffar, thus losing their grip over the Samanids, who became more or less independent. Nasr I used this opportunity to strengthen his authority by sending his brother Isma'il to Bukhara, which was in an unstable condition after suffering from raids by the Afrighid dynasty of Khwarazm. When Isma'il reached the city, he was warmly received by its inhabitants, who saw him as one who could restore order. Although the Bukhar Khudahs continued to autonomously rule in Bukhara for a few more years. Before his major victory against the Saffarids, he had made various expeditions in Transoxiana; in 892, he put an end to the Principality of Ushrusana by seizing all of its lands. During the same period, he put an end to the Bukhar Khudas in Bukhara. In 893, he invaded the territories of the Karluk Turks, taking Talas and converting the Nestorian church there into a mosque. Due to extensive excavations at Nishapur, Iran in the mid-twentieth century, Samanid pottery is well-represented in Islamic art collections around the world. These ceramics are largely made from earthenware and feature either calligraphic inscriptions of Arabic proverbs, or colorful figural decorations. The Arabic proverbs often speak to the values of "Adab" culture—hospitality, generosity, and modesty. ^ Elton L. Daniel, History of Iran, (Greenwood Press, 2001), 74. ^ a b Frye 1975, p. 146. ^ a b Paul Bergne (15 June 2007). The Birth of Tajikistan: National Identity and the Origins of the Republic. I.B.Tauris. pp. 6–. ISBN 978-1-84511-283-7. ^ Frye 1975, p. 145. ^ Taagepera, Rein (1997-01-01). "Expansion and Contraction Patterns of Large Polities: Context for Russia". International Studies Quarterly. 41 (3): 475–504. doi:10.1111/0020-8833.00053. JSTOR 2600793. ^ Canfield L., Robert (2002). Turko-Persia in Historical Perspective. Cambridge University Press. p. 12. ISBN 9780521522915. ^ a b Frye, Richard N. The Cambridge History of Iran. Cambridge University Press. p. 136. ^ a b c d Frye 1975, p. 136. ^ Gibb 1986, p. 685. ^ a b c Frye 1975, p. 137. ^ a b c d Frye 1975, p. 138. ^ Renee Grousset, The Empire of the Steppes:A History of Central Asia, Transl. Naomi Walford, (Rutgers University Press, 1991), 142. ^ "Samanids", C. E. Bosworth, The Encyclopedia of Islam, Vol. VIII, Ed. C. E. Bosworth, E. van Donzel, W.P. Heinrichs and G. Lecomte, (E.J. Brill, 1995), 1026. ^ a b Frye 1975, p. 140. ^ Bosworth 1968, p. 35. ^ Bosworth, C. Edmund (15 December 1998). "ESMĀʿĪL, b. Aḥmad b. Asad SĀMĀNĪ, ABŪ EBRĀHĪM". Encyclopædia Iranica. Retrieved 24 January 2015. ^ a b Frye 1975, p. 141. ^ A new text on Ismailism at the Samanid court, Patricia Crone and Luke Treadwell, Texts, documents, and artefacts:Islamic Studies in Honour of D.S. Richards, ed. Chase F. Robinson, (Brill, 2003), 46. ^ a b Bosworth 2011, p. 63. ^ Frye 1975, pp. 149–151. ^ Bosworth 1984, pp. 764–766. ^ a b c Frye 1975, p. 143. ^ "Mihragan", J. Calmard, The Encyclopedia of Islam, Vol.VII, Ed. C. E.Bosworth, E. van Donzel, W. P. Heinrichs and C. Pellat, (Brill, 1993), 18. ^ C.E. Bosworth, The Ghaznavids: 994–1040, (Edinburgh University Press, 1963), 131. ^ Michael Dillon, Xinjiang: China's Muslim far Northwest, (RoutledgeCurzon, 2004), 11. ^ a b c d e Litvinsky 1998, p. 97. ^ a b c d e Litvinsky 1998, p. 98. ^ Litvinsky 1998, p. 101. ^ Litvinsky 1998, p. 93. ^ Litvinsky 1998, p. 94. ^ Grube, Ernst J. (February 1965). "The Art of Islamic Pottery". The Metropolitan Museum of Art Bulletin. 23 (6): 209–228. doi:10.2307/3258167. ISSN 0026-1521. JSTOR 3258167. ^ Pancaroglu, Oya. "Serving wisdom: The contents of Samanid epigraphic pottery." Studies in Islamic and Later Indian Art from the Arthur M. Sackler Museum, Harvard University Art Museum (2002): 58-68. This page was last edited on 29 March 2019, at 09:39 (UTC).